Build a better future and better budgets. With ever tightening budget constraints and calls for reduced carbon footprints, municipalities are poised to see outsized benefits from LED technology. That’s why cities have been out front on energy efficiency initiatives, leading the way toward a clean energy future. 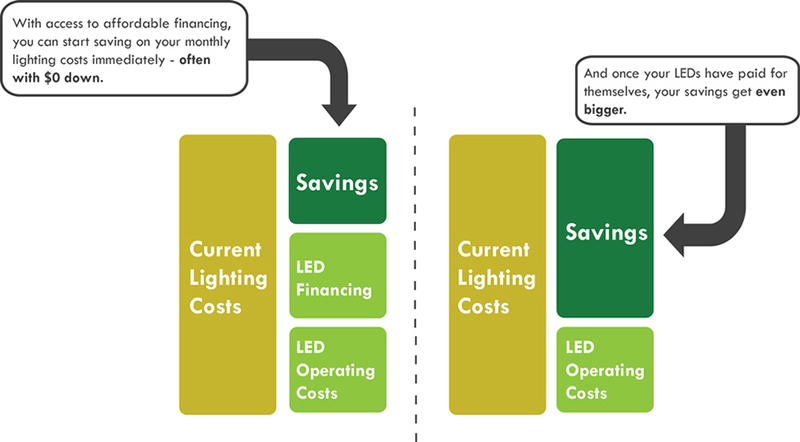 With their ability to significantly cut energy costs, LEDs offer governments the opportunity to meaningfully impact their operating costs while also keeping tons of carbon dioxide out of the atmosphere. This makes for healthier communities all around, while freeing up badly needed resources for other necessary services. With access to our innovative financing options, you can update your lighting infrastructure today and realize the benefits of upgrading immediately. By leveraging the savings on your electric bill with low-cost financing, your monthly payments including interest on your investment will be smaller than your old electric bill. That means more money in your pocket next month than you had this month.